Ecocor, a construction firm that manufactures, delivers and assembles high performance buildings, and Richard Pedranti Architect (RPA), a full service architecture firm focused on sustainable design, today announced a partnership to design and build the most energy efficient manufactured homes in North America. Together, Ecocor and RPA will produce prefabricated homes that are built to the rigorous Passive House standard, which conserves energy by creating a virtually air-tight, super insulated, compact building enclosure. Passive House represents the most stringent, low energy building standards in the world, and manufacturers in numerous European countries have been producing prefabricated Passive Houses for years. Ecocor is the first company in North America solely dedicated to manufacturing prefab Passive Houses, and it is the only North American company to have opaque prefabricated building components certified by the Passive House Institute (PHI). In the Ecocor factory, panelized walls, floors and other assemblies are fabricated in detail in a controlled environment ensuring the highest quality before they are trucked to and assembled on sites that have been evaluated and optimized for a Passive House building. This enables a much shorter time to completion than Passive Houses that are partially or entirely site-built. Ecocor recently added factory equipment from Sweden, a country where more than 90% of new homes are factory built. In the Company’s 14,000 square foot panelizing shop, the experienced Ecocor team engineers complete building panels, fabricates them using advanced semi-automated equipment, installs windows, and insulates them under controlled shop conditions. The partnership begins with eleven Passive House models programed for manufacture in the Ecocor factory. The models range from a 323-square-foot cabin with one bedroom to a 2,685-square-foot home with three to four bedrooms. Going forward, RPA will serve as the architect of the model homes available from Ecocor. The architecture firm’s detailed three-dimensional Building Information Modeling (BIM) plans integrate directly into the manufacturing software the machines use to produce each homes’ prefabricated components. RPA will provide architectural services to clients who wish to modify or customize a model home for their particular tastes and requirements. 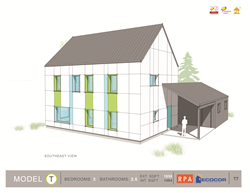 RPA will also work with clients to design unique, custom Passive Homes for pre-fabrication by Ecocor. Ecocor and RPA will work together in every stage of design, engineering, manufacture, assembly and finishing to ensure that each home is built to their clients’ greatest expectations and to the team’s exacting specifications. It is a goal to have all Passive Houses produced by the partnership certified by both Passive House Institute (PHI) and Passive House Institute US (PHIUS). Ecocor is a construction firm that designs, manufactures, delivers and assembles high performance buildings throughout North America. Ecocor’s patent pending foundation and wall designs reduce energy consumption for heating and cooling buildings by 80-90%, which substantially reduces the cost of ownership and the building’s carbon footprint, while increasing the comfort of its owners. Using patent pending processes to manufacture Passive House International (PHI) certified panelized building components, Ecocor has better control, higher quality and much shorter time-to-occupancy than any site-built construction. Learn more at http://www.ecocor.us/.